I have to admit, now that it’s February I’m really feeling the itch to decorate for spring. I know you’re probably laughing at that because there is still SO MUCH WINTER left, especially for us lucky ones in Colorado. And I have to agree—it is ridiculous to be thinking about spring in February, but I can’t help it. Maybe if I think enough positive/warm thoughts spring will come early this year. Puhleeeeze Mother Mature, is that too much to ask? Probably. But a girl can dream, right?! Right. Anyway, I’m ignoring the freezing temps and snow on the ground outside and starting to add little bits of spring decor into our home. 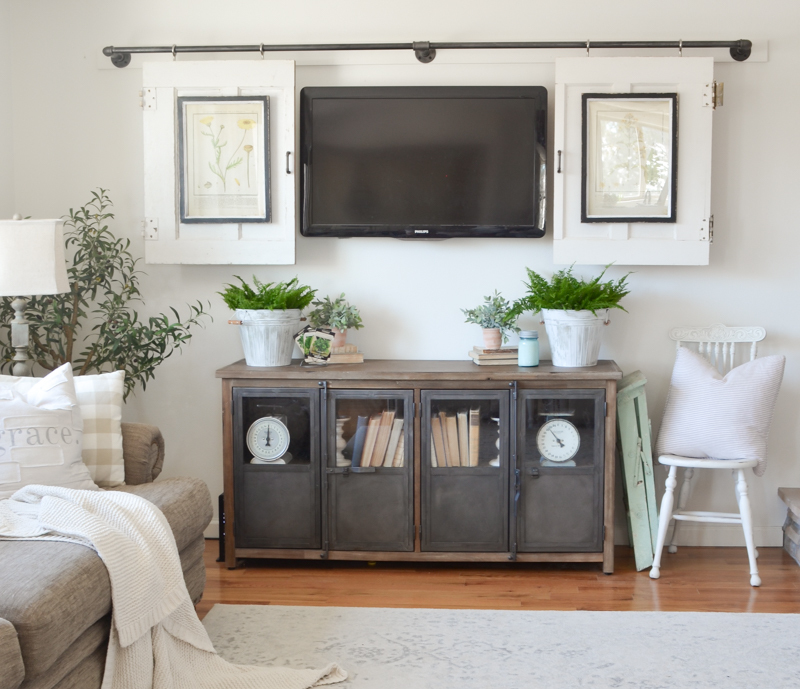 I actually just spruced up our living room and the storage cabinet with a few extra pops of greenery for a little pre-spring charm. 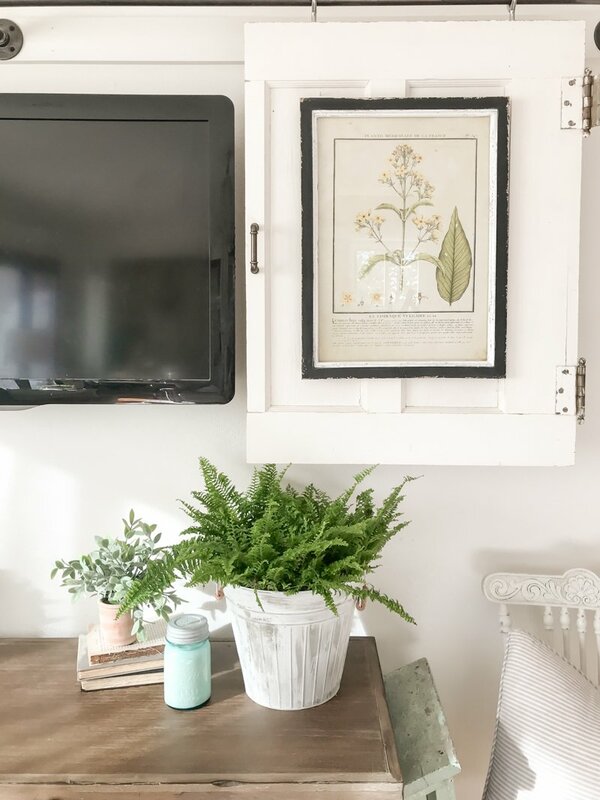 I kept it pretty simple on this storage cabinet and mostly just shopped my decor closet to put this simple early spring look together. But I did add in some fresh ferns just to give the living rom a little more life and energy. 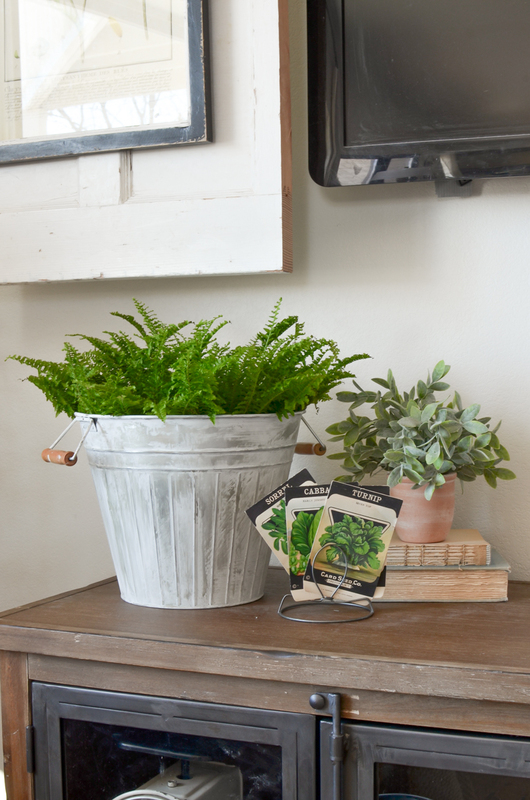 And those buckets the ferns are in actually came from the dollar spot at Target–I got them for five bucks! I did a fun little DIY to give them that aged look. You might remember that I had these botanical prints in our dining room for a long time. 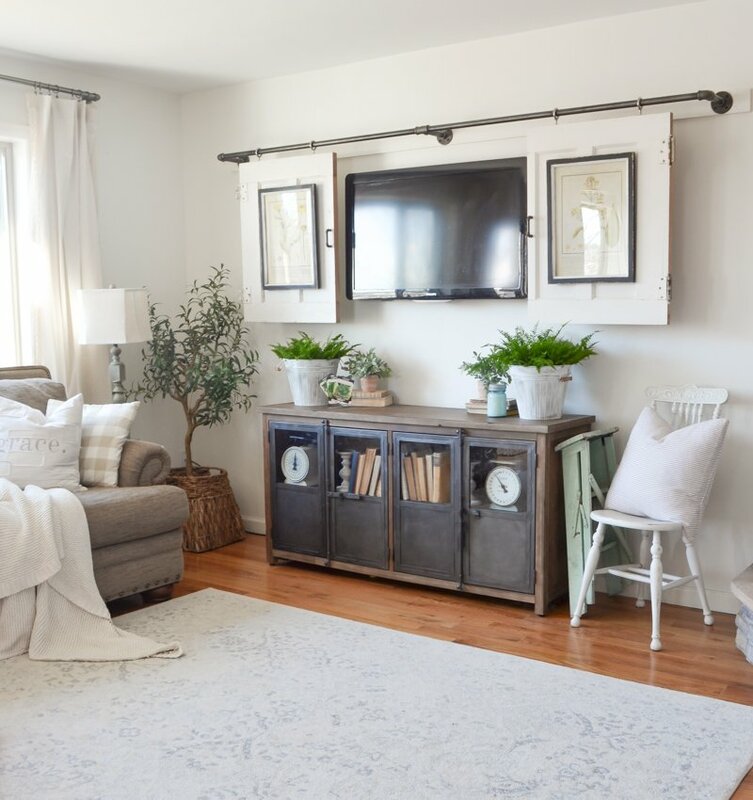 I actually bought them in a set of four, but I was getting bored of them in the dining room so I decided to try two of them here on these barn door TV covers. Kinda fun, huh? 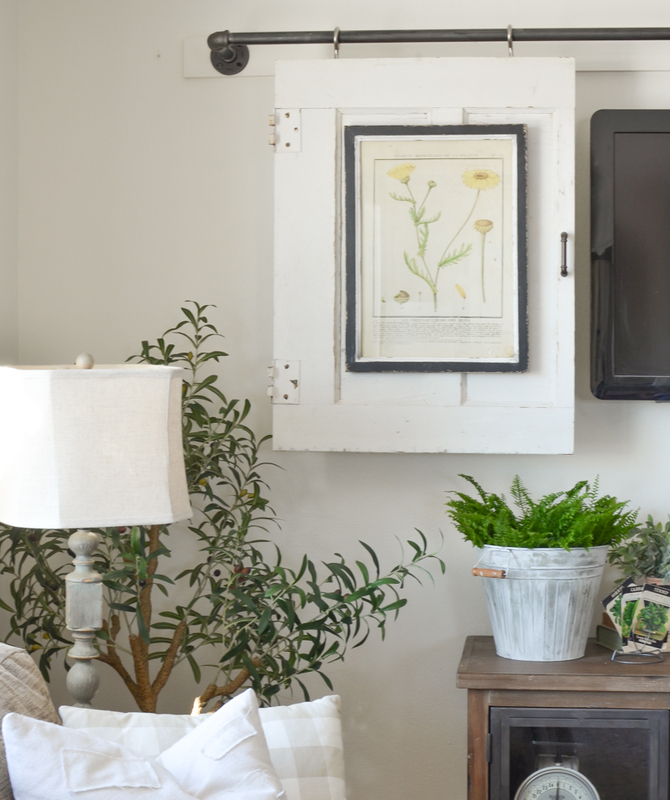 I love the black frame agains the white door and they’re perfect for spring. I’ve said it before and I’ll say it again–spring decor is my FAVORITE. 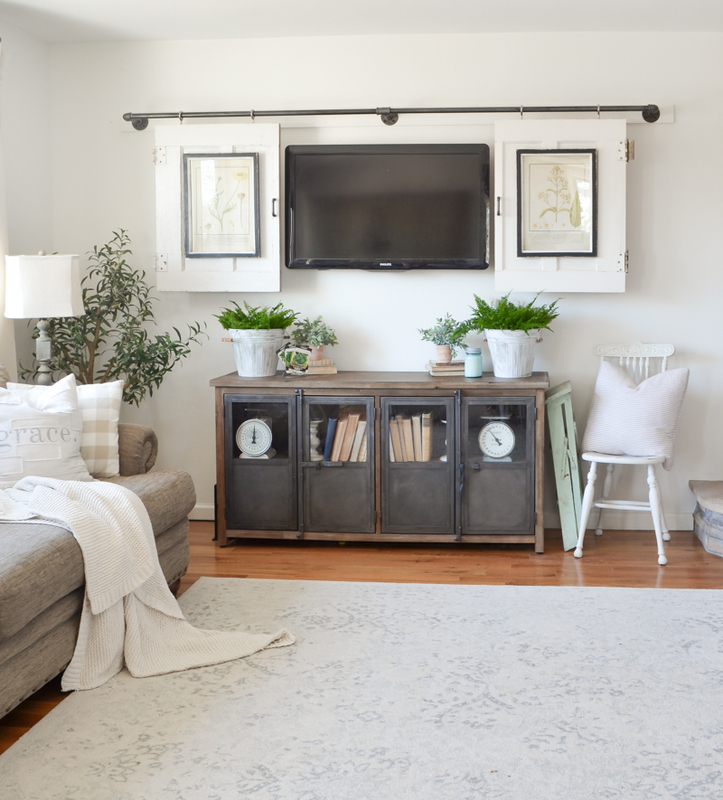 Well actually spring and summer both are my favorite seasons to decorate for in our home. I know it’s not necessarily the most exciting thing for a lot of people, like Christmas decor or even fall decor, but I just love the fresh and light feel that comes with spring. I can’t wait to add more spring cheer into our home and I’ll definitely share it with you guys as I go! Hi Sarah, everything looks so fresh and lovely. On your barn doors that cover the TV when closed, do you have any kind of stopper to make them not swing? Is swinging a problem? I could just picture one of my kiddos closing them with gusto and breaking the TV. I love how you aged your buckets that the ferns are in. I had picked one of those up at Target last year also and pictured a plant of some sort in it , but it is currently being used as a trash can near my desk. You’ve inspired me to work on getting some greens in there! How did you age the bucket? It looks really good. I enjoy your blog, it’s like a little gift 3 times a week! We are using your idea of the doors on the tv for our bedroom above the dresser. We are in the process now! So excited! Such a cool idea! Thanks for sharing how you did it! I love the botanical prints there! That’s the first thing I noticed!! 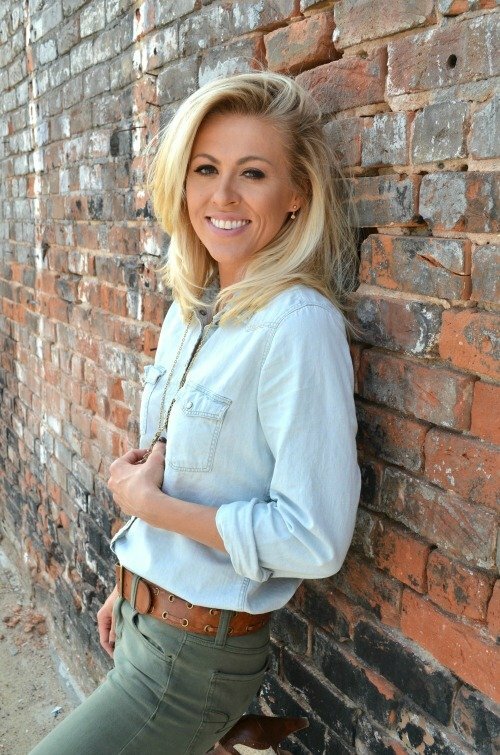 I’m sooooo ready for Spring too…every day we’re a little closer (I have to keep telling myself that so this gray gloomy weather doesn’t totally bring me down 😩)! Hope you’ll show us your DIY bucket makeover soon -they are too cute!! I love that you actually showcase your TV. So many bloggers just try to completely hide it. 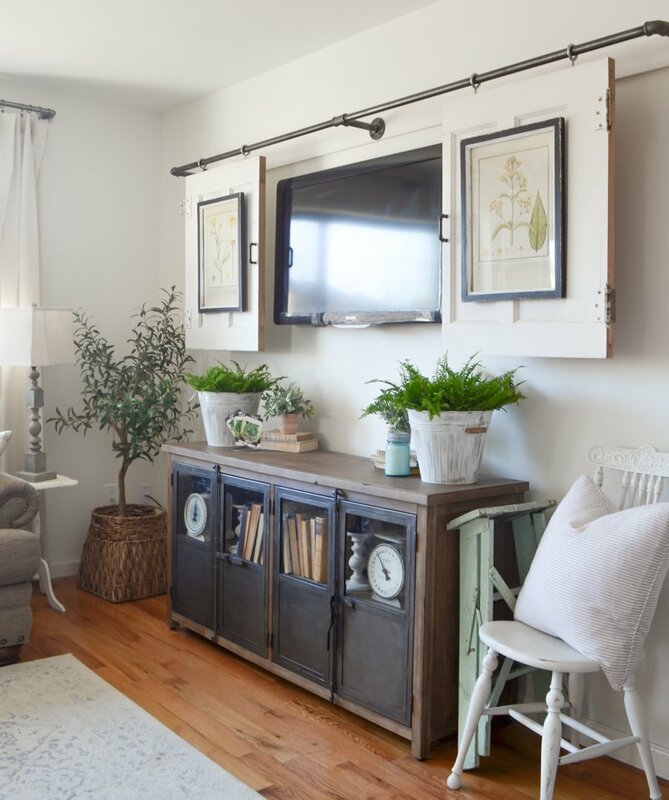 This room is so cute with the spring touches! Well I think your spring looks wonderful & although unfortunately there is more winter (we’re having a snow/ice storm right now in IA) I opted to get some spring out too, I could not take winter decor anymore! It has made my days much better! I know what you mean IOWA idiots out wandering about aka ME! hate the ice and even this snow bunny is ready for spring! I’ve just put the house up for sale. Have to “depersonalise” but want it to still look lived in, loved and welcoming. Any ideas to cheer the place up without clutter? Good morning Sarah, absolutely love waking up to see what you have. And inspires me more than you know as I care for my mother-in-law 24/7. So not much gets decorated like I’m used to doing anymore, but I truly enjoy seeing what you do and the little things are easy for me to try , thank you so much ! I love the ferns in those buckets! And the botanical prints look great on your sliding doors. 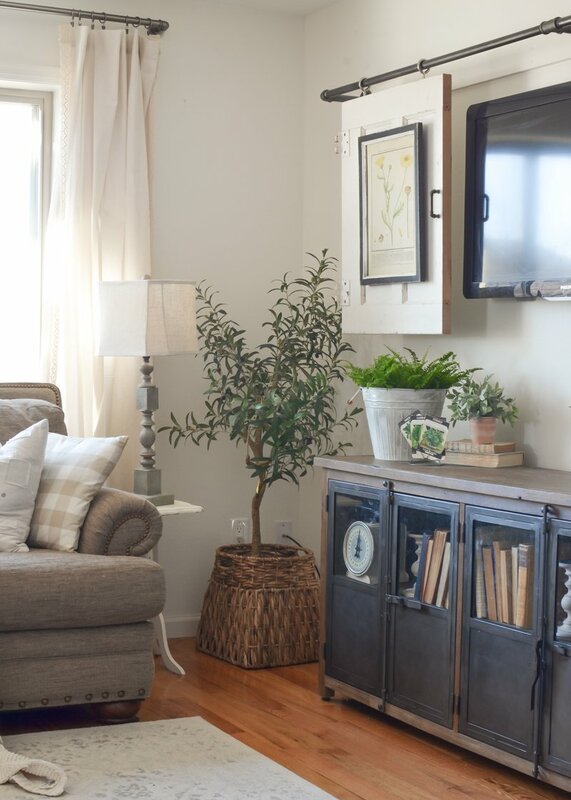 I also love the olive tree you placed in the corner. I hear ya on spring being still sooo far away though…it’s been -35 Celsius here this week! We came home from our holiday in Florida to those lovely temperatures! 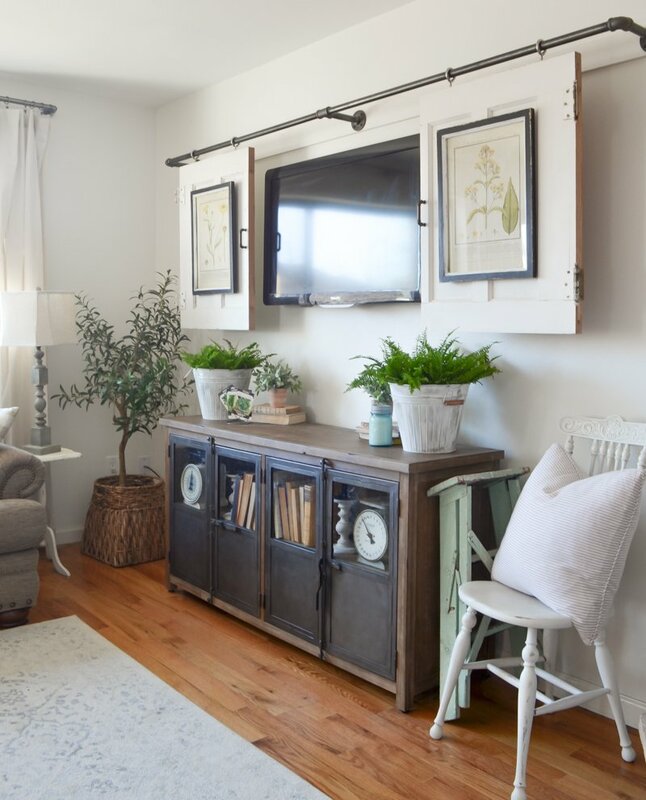 I don’t think it’s crazy to think about Spring or Spring decor especially when you live in an area like we do and the winters can be long and brutal. It kinda helps you get through the Winter months. I love how you placed the botanical prints on the barn doors. It makes the doors pop even more and the touch of greenery in those pots from the Target Dollar spot well, let’s just say I’ll be heading to a Target tomorrow. 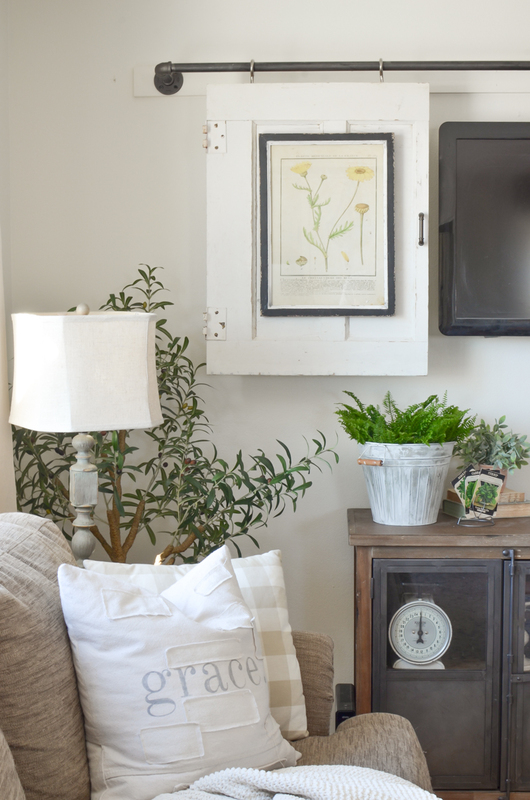 I love the touches of Spring in your already beautiful home. Oh I am so glad you shared! I have been thinking the same thing about starting to put out Spring touches and thought “no, I shouldn’t”, but yeah now I am!! Yes, please share as you go along with your Spring decor, i LOVE the flowers that are in the living room – they have a light pink/coral tone to them. I’m thinking that is the color I want to go with this Spring and of course I have my bird nests which I love to put out too! Thanks for telling us where you purchase your items so we can purchase them too! It all is so pretty. Are those real ferns? Hi, Thinking of doing something similar with our TV. How do you hide the wires? Loved it when you said you shopped your décor closet. Keeping it budget friendly at this particular time in my life has me doing a happy dance! Thank you for the reminder. Yes definitely, Amy! I always do that first before buying anything new. I love everything you do! 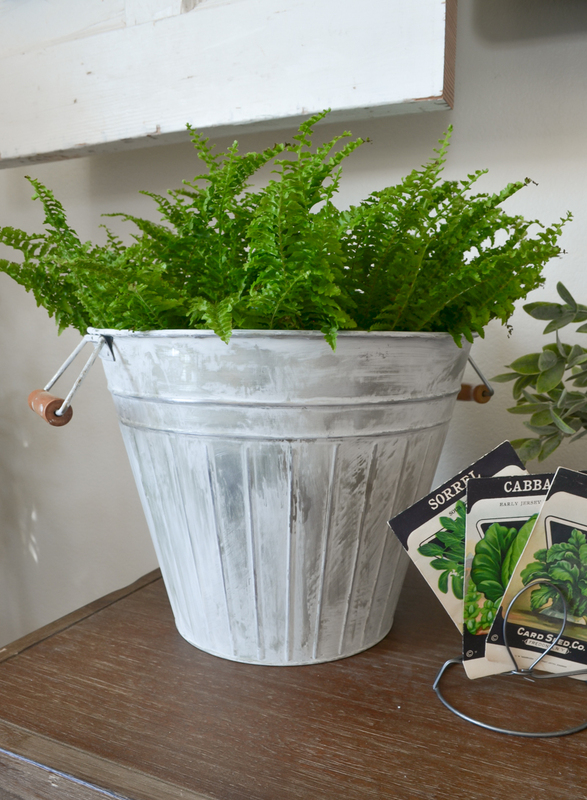 Those buckets with the ferns in them are soooo cute! How did you paint them…just dry brushed white on them? Love it all! Do you happen to recall where you got your tree and the basket it is in that is in your living room? I have been searching for something like this. Hi Kelly. That’s actually an old olive tree from Pier 1. Unfortunately they don’t sell it anymore!